Obverse: Henry VII enthroned on high-backed very ornamental throne with greyhound on left and dragon on right side pillars, holding orb in left hand and sceptre in right hand. Text around HENRICVS DEI GRATIA REX ANGLIE ET FRANCIE DNS IBAR, double saltire stops. Reverse: Square-topped shield of the royal coat of arms in centre of a Tudor rose, within double tressure. Text around IHESVS AVTEM TRANSIENS PER MEDIVMILLORVM IBAT (But Jesus passing through their midst went His way), double mullet stops. 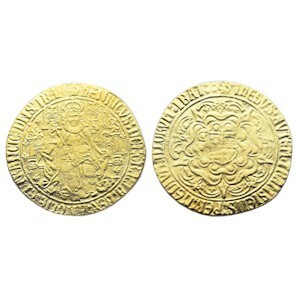 History: In 1489 radical changes were made to the coinage of Henry VII. Though the pound sterling had been a denomination of account for centuries, a pound coin had never been minted. Now a magnificent gold pound (20 shillings) was issued, and, from the design of the king enthroned in majesty, was called a ‘sovereign’.